Stroll with Alexander Hamilton as he shares anecdotes while pointing out what is still familiar to him in NYC. This tour makes history come alive as Alexander Hamilton talks about the creation of the United States from his days at Columbia University to helping the Constitution become ratified. The walking tour will last for about 2.5 hours and will make frequent stops to point out over 20 historical points of interest that exist from Colonial New York. We start at City Hall and end at Trinity Church. Your Guide is a professional Colonial Reenactor, Historian and licensed NYC Tour Guide who has been leading educational tours since 1990. 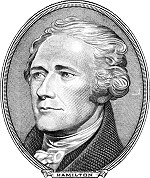 A professional quality wireless communication receiver and headphones are made available so you do not miss any of the wit and wisdom of Alexander Hamilton.